While doing your shopping list have you ever gotten the feeling that there was a lot of useless duplication being done from week to week? Luckily you’re not alone, since there are loads of grocery list helpers out there making the process faster and simpler. The following post is meant to help you learn about the options available to you and to highlight what makes each one different from others. It’s one of the recommendations in the article about the top 34 ways to trim your grocery bills that made me realize that it could be a good idea to talk about the best shopping list apps available out there. I mentioned that there were loads of them, but I didn’t elaborate much on the subject. So here is our top 4. There should be a little something for everyone in there, from tech junkies to simplicity fans. 1. Grocery iQ is the reference in the world of grocery list helping apps. On top of being free it has a UPC scanning feature that makes the creation of a shopping list a breeze. Other than that, it comes with all the other bells and whistles you’d expect from this type of app, from an auto-suggest function, a favourite items function, a 130,000 items database, a list syncing feature that helps you update your spouse, create lists for multiple stores, and you can also sort items by aisle (in other words, put them in order). There is also a feature that you will either love or hate. Being owned by Coupons Inc you will constantly be updated with printable coupons. While most people like this feature, some may find it a little intrusive. 2. Grocery Gadget comes in 3 different versions: Free (20 items limit), Basic ($0.99) or Standard ($3.99). Of course the quantity of features you get will vary depending on the version you opt for. What makes this app stand out from the other ones is how easy it makes it to share grocery shopping duties by updating your partner when you’ve crossed an item off the list. Plus, by letting you take pictures and scan bar codes, you’re always sure that you get the right brand/product. This app’s biggest downer is the fact that its full version retails for $3.99. Which makes it one of the priciest options out there. 3. Our Groceries is another much appreciated grocery list handler that is available for free. It’s pretty simple to use and syncs with all the other people who you share grocery responsibilities with. Like Grocery Gadget, others will be updated once you cross items off your list. What will most likely annoy users though is the fact that this app is filled with ads. Luckily, if that gets on your nerves too much, you have the possibility to buy the ‘Our Groceries key’, which will make this app ad free. 4. The ShoppingList app from Werner Freytag stands out from its counterparts by being one of the most simple apps out there and the fact that it enables you to enter a product’s price, instantly adding all the amounts, making it easy to keep track of how much it’s costing you so far. 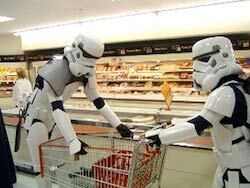 Helping to avoid surprises at the checkout. At $0.99, it is a very decently priced app, that isn’t filled with ads. But it also comes with less features than some of the other apps mentioned previously, making it the mid-range option. How about you? Do you have some other grocery listing apps to suggest? Have you tried any yet?